Flavored with Earl Grey Tea, these Tea Poached Pears with Apricots and Cherries are rich with cinnamon, cloves and a hint of orange. Poached pears are a fabulous last minute dessert that you can make ahead of time – no fancy baking skills required! 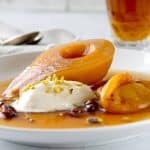 Poached pears are one of my favorite desserts and these Tea Poached Pears with Apricots and Cherries are a delicious twist on the more traditional wine poached pears. Using tea instead of wine results in a lighter and more fragrant syrup than those made with wine and is perfect for those who don’t imbibe! These poached pears are incredibly easy to make – and are an excellent last minute dessert! Which pears are best for poached pears? Bosc and Anjou pears work best for poaching since they don’t fall apart when cooked. 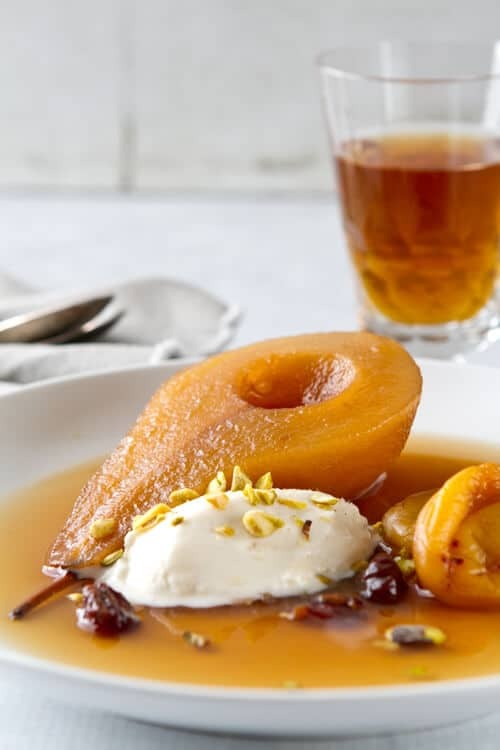 Asian or Korean pears also make delicious poached pears – like these Reisling Poached Korean Pears. The key is to buy pears that are on the hard side. Really ripe pears don’t work as well and since the pears in the stores typically aren’t ripe, poached pears make a fabulous last minute dessert! You can make these poached pears entirely ahead of time and then gently re heat them before serving. Add a little dollop of creme fraiche or even plain greek yogurt and a sprinkle of chopped pistachios. No fancy decorating required – the poached pears are beautiful all on their own! So what are your “little black dress” recipes? I need some new ideas so I’d love to hear what yours are! Adapted from Bon Appetit January 2004. To core the pears a melon baller works beautifully. In a large saucepan bring 3 cups of water to a boil. Add the 4 Earl Grey tea bags, remove from the heat and steep for 10 minutes. Remove the tea bags return the pot to the stove and heat over medium high heat. Add the sugar and stir until the sugar is dissolved. Add the pears, apricots, cloves, cinnamon sticks and star anise. Simmer for 6 to 10 minutes or until the pears are tender when pierced with a knife. Remove the pears and reserve. Add the cherries and bring the mixture to a boil. Reduce the heat to a simmer and simmer for approximately 15 minutes. Strain out the cloves, cinnamon and anise pods. Return the pears to the poaching liquid. If making ahead, place the pears and the poaching liquid in a covered container and refrigerate. Warm gently before serving. To serve, place 1/2 of a pear on a shallow serving plate. Add a scoop of vanilla ice cream or gelato and sprinkle with the chopped pistachios. Add the reserved apricots and cherries as a garnish and pour some of the poaching liquid around the pear. Just gorgeous. I’m the first to forget just how fabulous a warm pear dish is; thanks for the lovely reminder!